"Barangnya udah nyampe kemaren gan,cd driver receivernya pecah. -_-" tp gpp deh,bisa download sendiri.hehe barangnya mulus bgt,tp ntaran packingnya agak tebelan dikit ya biar boxnya ga hancur.hehe. tp yg jelas bekasi game paling oke lah,harga paling murah se google dan juga cepat tanggapnya. mantep! :D "
Xbox 360 has more ways to play, and now for a limited time get two free games and a one-month trial for Hulu and Epix. With the largest portfolio of games to choose from, there’s something for everyone — from classic titles to the biggest blockbuster games. The spacious 250GB hard drive gives you the space you need to store arcade games, movies, demos, and even full Xbox 360 games. Plus, with built-in Wi-Fi, it’s easy to connect to Xbox LIVE to access tons of great entertainment — from HD movies and TV shows to live sports. 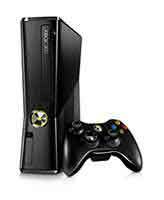 The Xbox 360 S console runs whisper quiet, letting you play games and watch movies without interference. Easily connect to Xbox LIVE, play with friends* all over the world and experience a world of entertainment. * Xbox LIVE Gold membership and/or other subscriptions and requirements apply for some Xbox LIVE features. See xbox.com/live. Broadband, games, add-ons and media content sold separately. The Xbox 360 is the only console with 802.11n Wi-Fi built in for a faster and easier connection to Xbox LIVE. Download or stream HD movies, TV episodes, and games from Xbox LIVE Marketplace in 1080p and 5.1 surround sound from anywhere in the house. Compatible with b/g/n networks. This award-winning, high-performance wireless controller features the Xbox Guide Button for quick, in-game access to friends and music. It has a range of up to 30 feet and a battery life of up to 30 hours on two AA batteries.